Check with all necessary department event coordinators as needed to avoid double booking. Consider checking for the Dean's availability before confirming dates by emailing the executive assistant. Identify date, time and location based on availability. View a list of centrally scheduled rooms with technology for recording your classroom lectures. 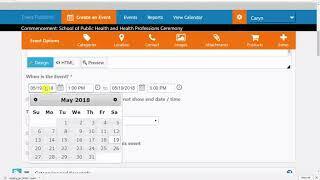 Using the Department Scheduler to schedule a space (ubit login required). Request recording services through UBIT (ubit login required). Lecturer photo video release form for approval of recording/live streaming. Add confirmed dates to UB calendar.